The Yakovlev Yak-52 is a Soviet military trainer that fits nicely into the hierarchy of DCS World. Fully aerobatic with high G-limits and a snappy roll rate, the Yak-52 is a great choice for both initial training and advanced maneuvers. First flown in the mid 70s, the Yak-52 is powered by a 360hp radial engine with partially retractable landing gear in a tricycle configuration. It is a two seat primary trainer that has also found popularity on the secondary market as a competition aerobatic aircraft. 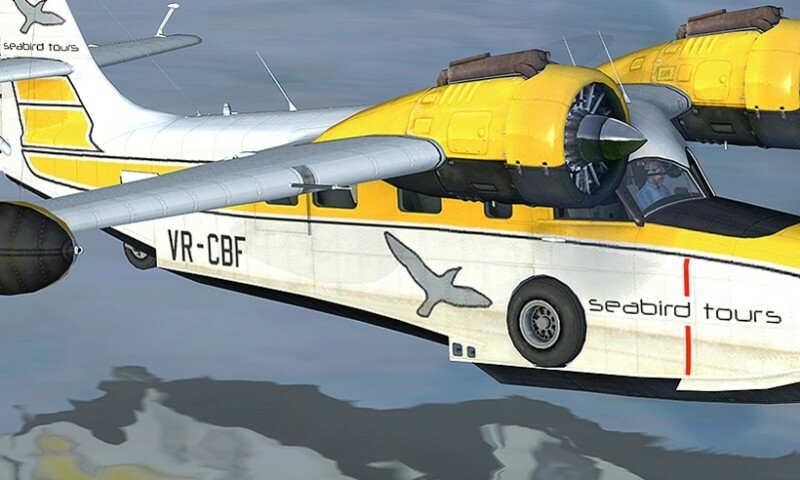 Rugged and relatively simple construction are hallmarks of the Romanian built airplane which evolved into several variants over the two decades it was in production. 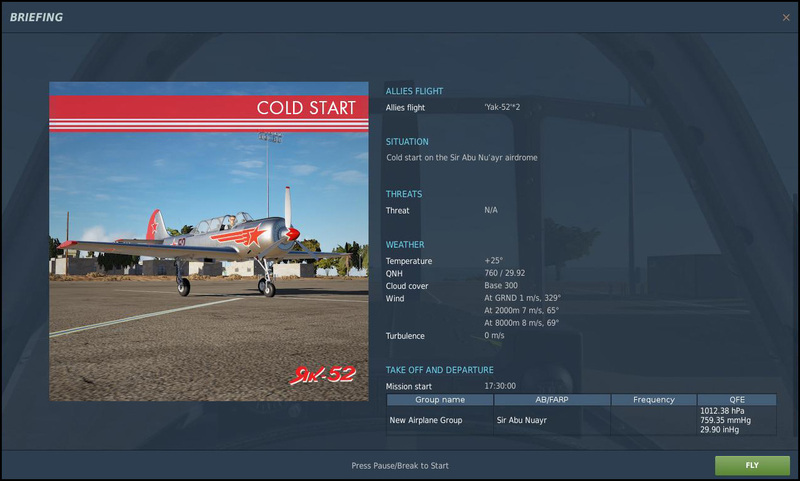 As with many of the modules that have been released in recent years for DCS World, the Yak-52 is currently in “Early Access”, meaning that it is not feature complete, and is still undergoing development. With that said, it appears that most of the heavy lifting has been accomplished with a very robust module already at this stage and one would hope the remaining refinements would come along in short order. The Yak-52 has options for Russian, English, and Chinese cockpits, although it was my observation that the English cockpit is not really a total conversion. Many of the instruments and radios are still in Russian, although one might expect that to be true due to the many proprietary instruments that would be required to be in the aircraft even if it were owned by a Westerner. You can’t just crack open an ADI or altimeter and relabel it without regard for the integrity of the instrument. That said, this is a simulation, and it might be a nice option to have fully localized versions for those that might desire it. Documentation is to the typical professional and high quality standards that Eagle Dynamics is known for. The 194-page manual details the history of the Yak, specifications, limitations, and full systems descriptions. A full Flight Preparation section will get you up and flying and provides excellent instructions, graphics, and tips to the new Yak pilot. 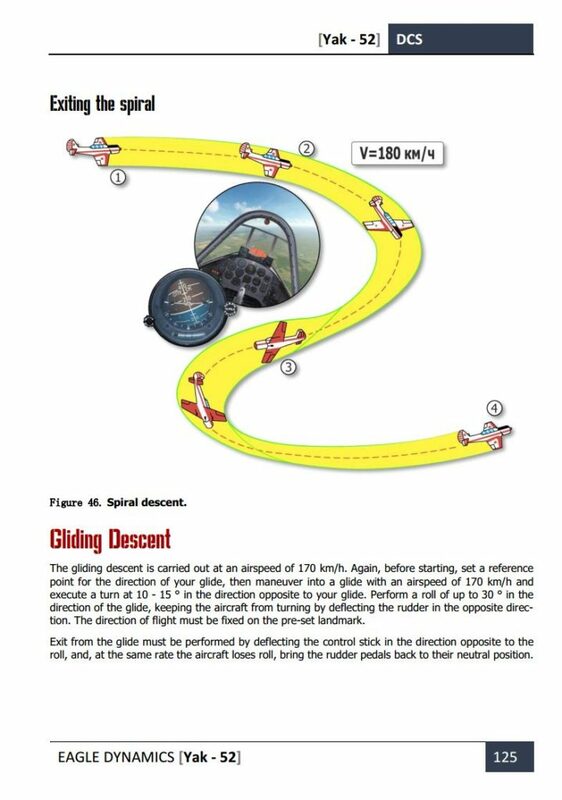 The Flight Operations section, detailing the physics of flight, and the Aerobatics sections are exceptionally well presented and go beyond what one might expect from the documentation. As is the case with most DCS modules, specific settings can be set to tailor the experience to your experience level. 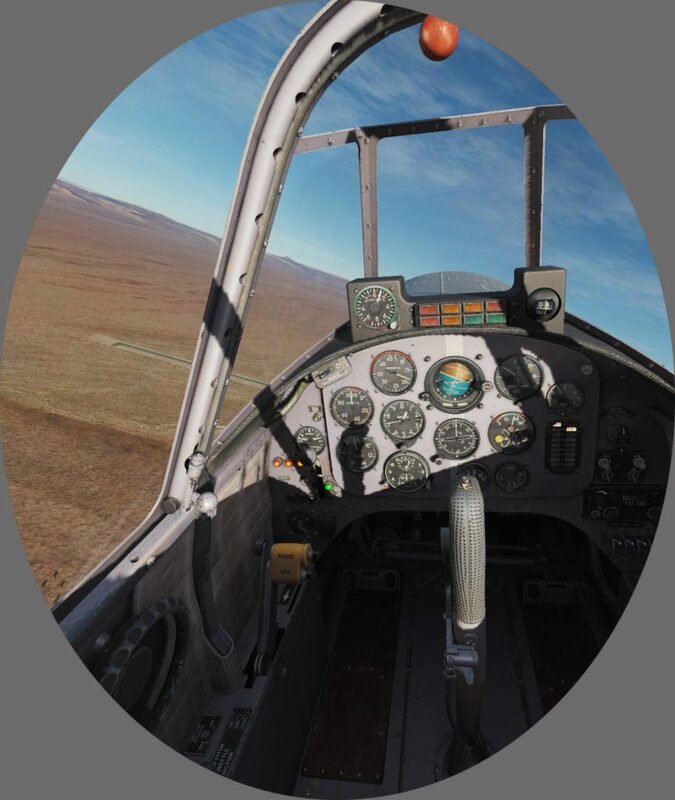 Take-off assistance and auto-rudder are among some of the options available to ease pilot workload, although I’d encourage users to use full realism to maximize the learning potential from the module. Somewhat disappointing is the inclusion of only three training missions and five quick start missions. 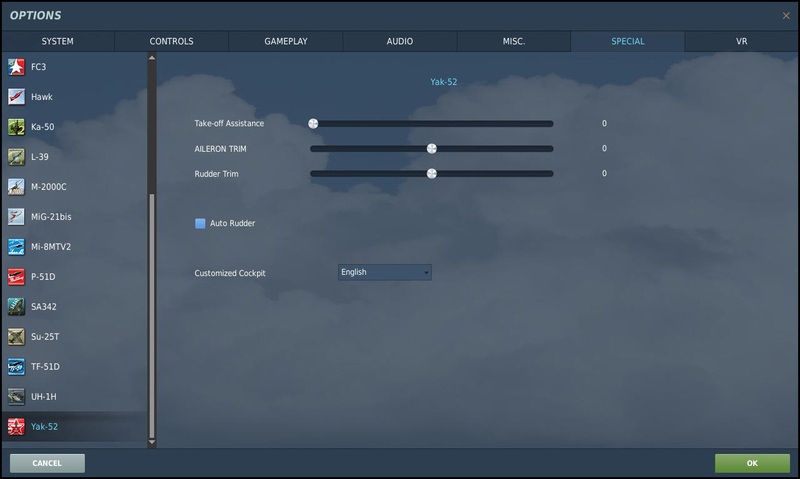 Granted, the quick start missions do include the possibility of flying in all of the four possible DCS World theaters if you own them, so there is that multiplier to be considered. The missions do not contain detailed briefings however, and they do seem to be afterthoughts rather than true showcases of how much detail has gone into the aircraft. 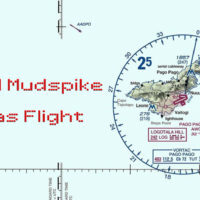 The training missions, which include the startup, takeoff, and landing, are voiced over nicely and use the well implemented arrows and highlights that guide you around the cockpit. The product is Early Access, and I’m sure there was a desire to get it out the door and to a wider audience, but I really think it is a disservice to the module to not ship it with more content out the door than what is here. Hopefully missions including navigation, emergencies, aerobatics, and additional content in the form of some sort of training syllabus campaign are forthcoming. It is no surprise that the 3D modeling and artwork of the virtual cockpit are simply stunning in all regards. Both the front and rear cockpits are modeled, with nearly every button and knob clickable and functioning. 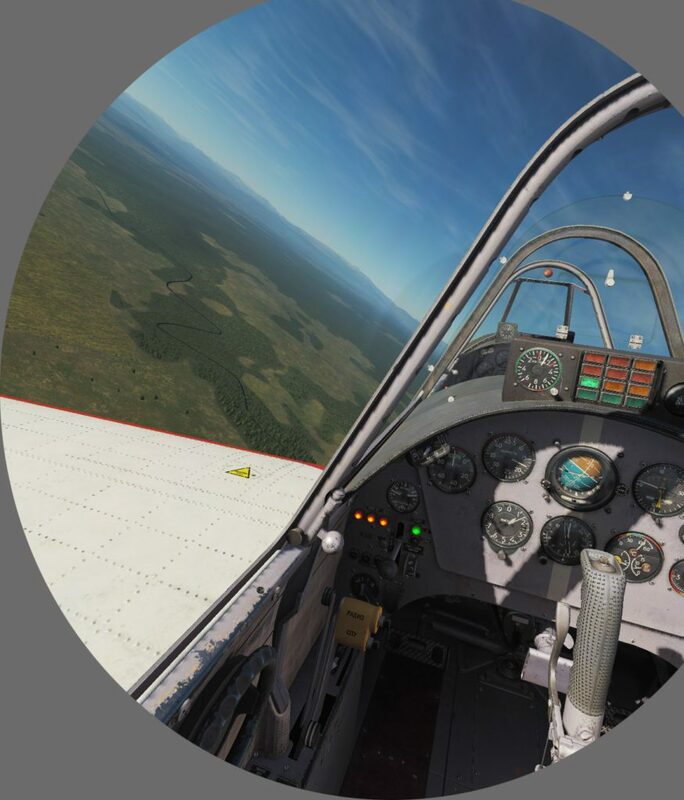 The Russian cockpit layout and instrumentation is largely familiar to those of us that have flown Russian flyables in DCS World, so no big surprises there. The most striking difference is, of course, the crazy attitude indicator that flips us Western pilots on our heads (literally) as we try to grasp what it is telling us. The gyro is stabilized to the horizon in such a way that the presentation moves opposite of what typical ADIs show, with ground and sky transposed to reflect the pitch of the aircraft relative to the horizon. In IFR, this ADI will kill most of us unless we start to fly the Yak exclusively. It is a very difficult brain/stick disconnect for those of us that have mastered the modern ADI. Cockpit detailing is superb with nice wear, geometry, and just an excellent overall presentation. 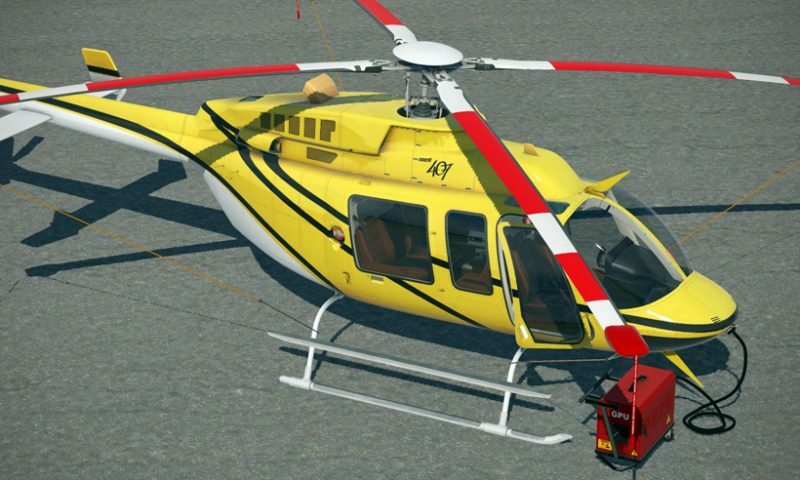 I’ll throw my opinion on the pile that thinks this plane should have the NS 430 GPS available as an option that could be bolted into the cockpit somehow. 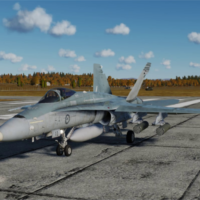 Heck, for that matter, I’d love to see an option for a Westernized avionics mod that could be sold as DLC. And while we are making our wish list, how much fun could we have in the Yak-52B with rockets and smoke markers acting as a Forward Air Controller? Eagle Dynamics have stated this module is a trainer and the current company line is: “There are no current plans for bringing the version with weapons to DCS World at this time.” That sounds pretty definitive. 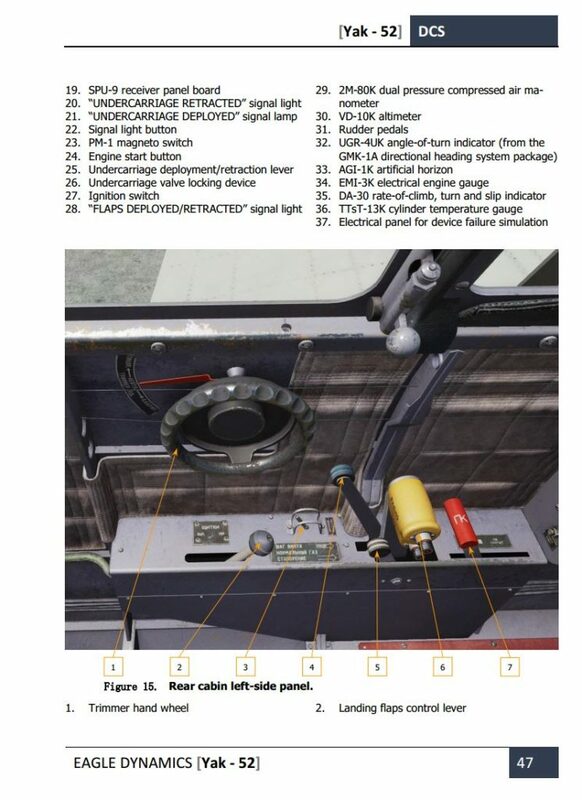 During the well structured training missions, you will learn all the steps to properly preflight the cockpit to include testing many of the systems for correct functionality prior to flight. If you were to skip all of the required safety checks (tsk-tsk), the plane can be brought to life quickly with just a dozen steps or so. The sounds are superb and the low rumble of the engine and the slight vibration of the instrument panel is fantastic. The cockpit looks gorgeous in VR with excellent presence and readability of the gauges and instruments. 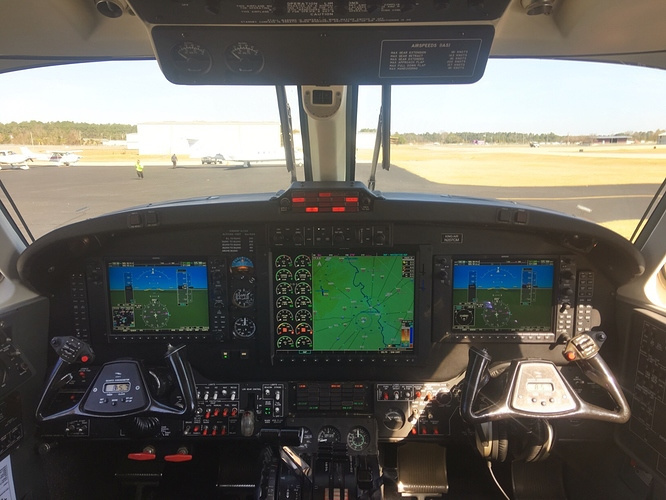 Once you bring the plane alive, the vibrations of the panel and flickering of the fuel quantity indicator lights give the plane an excellent atmosphere. You can almost smell the dried vomit (hey, that’s a compliment!). I do find the canopy glass from the inside to be a bit too clear and would love to see just a very slight bit more texture to it to let me know it is there. With pneumatically controlled gear, flaps, and brakes, you’ll be hearing the hiss of compressed air during any configuration changes or braking. Differential steering is accomplished with rudder and a tap of the braking lever. I found the rudders become aerodynamically effective at around 30kph with the initial tendency for the aircraft to want to pull to the right thus requiring some slight left rudder throughout the takeoff. At around 100kph rudder input is pretty much neutral and then throughout liftoff and the climb I found neutral rudder and just a slight right aileron input were all that were required. The flaps are used for landing only and they impart enormous drag, so keep them up for takeoff and retract them during go-arounds. The landing gear retracts to a slightly trailing position to reduce, but not eliminate drag. In testing, with maximum power and full fuel, the climb rate with the gear and flaps down is a measly 1 m/s. Raising the gear does very little to improve that. Raising the flaps results in a very quick drag reduction allowing for a climb rate of 6 m/s. The drag penalty with flaps down seems excessive, but I’m not a Yak-52 pilot, so that may be correct. You’ll find the pitch trim useful and necessary for much of the flight. Aileron trim and rudder trim are not controllable in flight, but rather trim tabs are preset by the pilot prior to flight to provide for neutral control force at the desired speed. So while the plane may roll or yaw slightly during climbs or high speed descents, the trim would likely be set for the cruise portion of flight to allow for relative hands free flight. The plane is quite docile on landing. In a no-wind situation it is entirely possible to land and rollout without touching the rudder if you are careful. A tailwheel configuration would no doubt be much more challenging. Roll rate matches up perfectly to the advertised rate of 180° per second (I measured 3 aileron roles in around 6.13 seconds). Stalls and spins are nicely modeled. 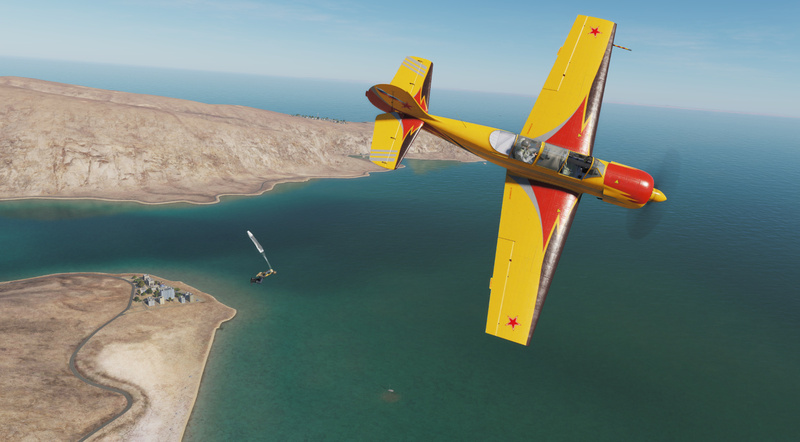 Throughout all my testing, I found the Yak will fall into a spin with a little dose of rudder and full aft stick deflection through the wing drop. Once established in the spin, usually a relaxation of the back pressure on the stick will allow the airplane to exit the spin on its own after one rotation without anti-spin inputs required. 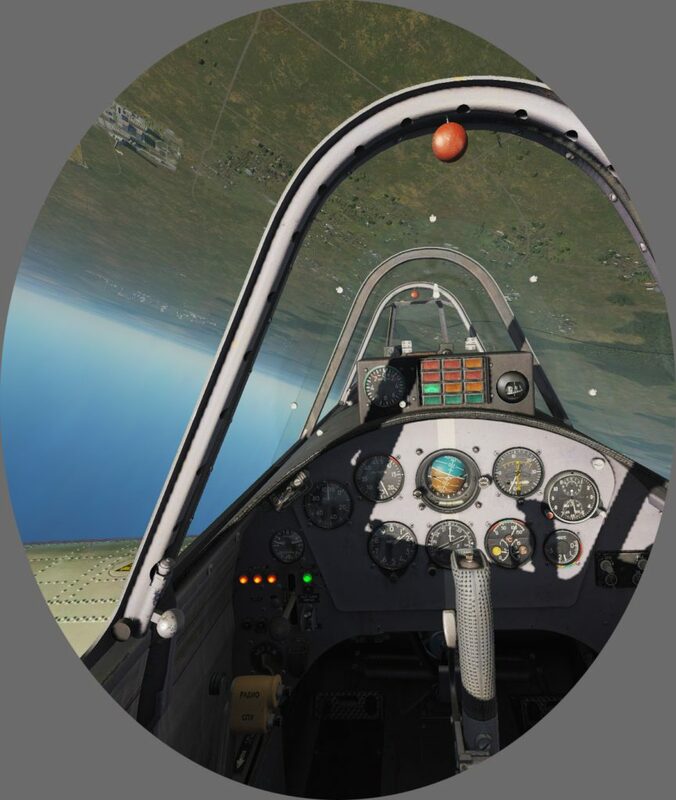 I was curious about this behavior, so I did ask a real Yak-52 pilot on the ED forums about it and he stated that indeed, the Yak-52 generally requires pro-spin control inputs to stay in a spin except under some particular circumstances. The airframe noises, buffets, snaps and pops during the spins is fantastic. During rapid power application after idle throttle, the engine surges with a satisfying roar as the prop governor works to correct the quick overspeed condition – it is really well done. 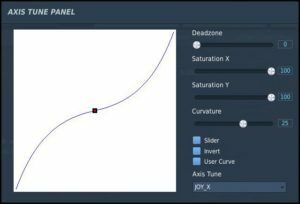 I found the controls to be a bit too sensitive with linear settings and put a curve of 25 on the axes which felt like what I imagined the sensitivity should be. Aerobatics are a blast and though I’m not an accomplished real world aerobatic pilot, I managed hammerhead turns, aileron rolls, loops and other maneuvers without difficulty. I even managed what I felt were respectable snap rolls that looked good from the flyby view and corrected with precision after practicing just a few of them. For navigation, the aircraft has an ARK-15M ADF that has the ability to store up to four outer beacons and four inner beacons. These must be preset in the Mission Editor. I was able to tune and ID the beacons, but my ADF needle was not moving, so I’m not sure if I had a switch set wrong or if this is an Early Access feature that is not quite working yet. I was relieved however that the needle was not working since that prevented me from going into IMC with that dreadful ADI and killing myself outright. The damage model is not implemented in a visual sense in that parts don’t go flying off the aircraft, wings stay attached, the propeller doesn’t deform, and so on and so forth. As a systems and procedure guy (and Certified Flight Instructor/Instrument) I love the Yak-52 in its present form and am excited for the possibility of integrating it into something larger. 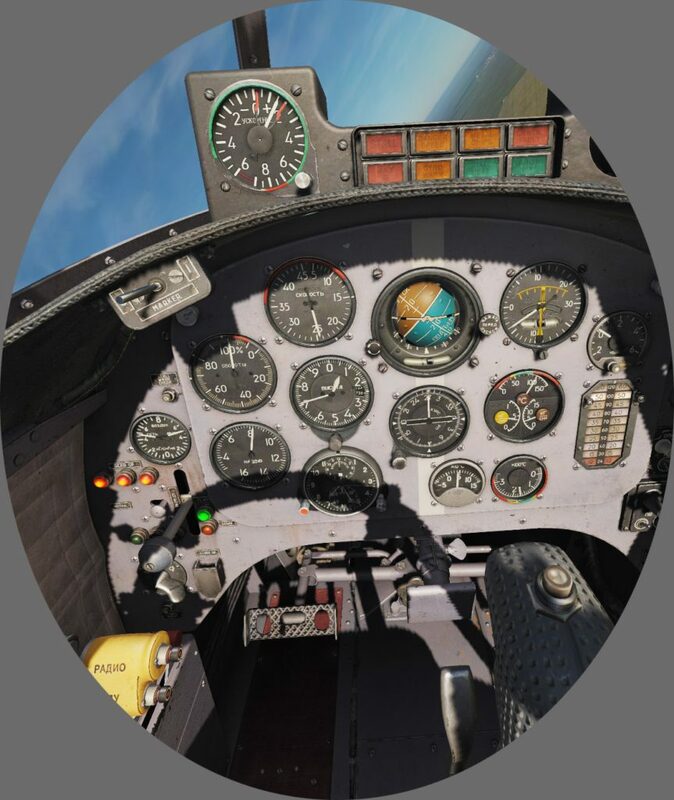 It is my hope that once all the details are worked out with the airplane itself that we will see either the developer or a third-party campaign builder create a real career pipeline in DCS World that lets us role-play a new pilot embarking on a full training syllabus. All the parts are there now Yak-52 > L-39 > Su-27/MiG-29/Su-25T. It isn’t hard to envision a primary flight course similar to what Maple Flag Missions has created for the A-10C. Primary flight, pilotage and dead reckoning, NDB navigation, IFR flight, non precision approaches, emergencies, aerobatics, and formation flying are all concepts that would translate well in the Yak-52. The foundation for great content is already there in this Early Access product, but the content creators must come if we are to realize the full potential of this very cool aircraft. Does it drop or shoot things that go BOOM? It’s not for you, @Hangar200. He can still bail out, though. And no, the version we have is completely unarmed. I’m sorry Hangar 200 but that is funny! That is soooo wrong! You destroy a few Viggen and you are labeled for life! “Hangar200…The AJS-Annihilator”! My innner child is weeping. I think I’ll pick this one up this winter, just because I like quirky Russian aircraft. Granted, it’s no IL-2 or IL-10, but I like the subject matter. I sure hope RAZBAM’s A-29 will have a lot of the same training features so we can go from Yak-52>A-29>L-39>Fast jet. Yes. I would absolutely love for a bit of a role-playing element to DCS World with a more robust rank system, squadrons you carry with you through campaigns and single missions, and other little things to liven up the game and make one feel invested in their character. You read the request here first - Eagle Dynamics Loot Boxes with custom aviator scarves! Let’s get a career system in place before loot boxes! Otherwise, Doki Doki Aviation Club might outsell DCS. I want to manage my pilot’s thirst, hunger, and rest. Why would they change the ADI anyway? It doesn’t make sense to change a system behaviour. Because people retrofit cockpits all the time? Case in point…our King Air…where I don’t think they left a single system intact! I’m with you on the non-EFIS ADI. I’m not really a fan of glass cockpits. Prefer steam gauges. Speaking of gauges I believe that you have to switch the ARK-15 into radio compass mode for the RMI guage to work. You might also need to press the button to the right of it to make sure that the panel in whichever cockpit, front or back, that you are in is controlling the ADF unit. 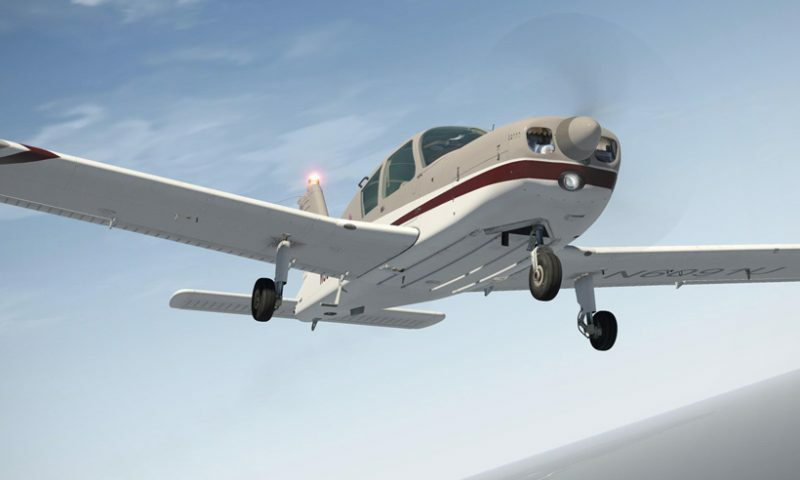 @BeachAV8R Have you tried out Flight 1’s Super King Air B200 Blackhawk for FSX/P3D? If so, what did you think of it? Have you tried out Flight 1’s Super King Air B200 Blackhawk for FSX/P3D? If so, what did you think of it?